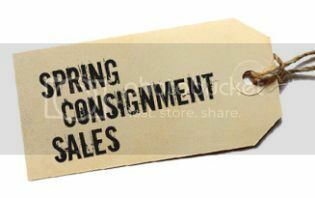 I am again preparing for two spring consignment sales. I enjoy getting the checks from the sales so that it helps pay for my daughter's wardrobe for the coming season. I enjoy shopping consignment sales to get good clothes at very low prices. However, I cannot say that I enjoy this part of the task. Over the years, my daughter has turned the guest room, the one room in my home that always used to look as if it was ready and just waiting for a visitor to stay there, into her own personal dumping zone and clutter just overwhelms me. I have asked her to keep it organized with all the clothes hung, but her idea of organized and mine differ. It is difficult for me to plow through, organize the items I wish to sell, and tag everything because no matter how I do it, it still has that clutter quality until most of it is dropped off at the sale. This time I choose the earliest drop off on Monday morning. Even after dropping off what will be allowed in the spring sale, I still have some fall items that will be waiting for half a year, which increase in number and bulk by the fall. Clutter...it just drives me crazy, especially when it is unending as it has become in my guest room. My husband has suggested several times that I could just give away the outgrown clothes and I toy with that thought until I start adding up the potential net pay from the sales. That thrifty side of me just cannot get past that these sales generally pay for at least half (most of the time more) of the cost of the clothes I will be buying for the Princess and it is getting more difficult to find consignment clothes for her. She is more particular, as expected with this age, as she is exploring her own sense of style and there are fewer modest styles for her size--I am thankful that modesty is still important to her. In addition, we cannot have her try on clothes at most of these sales, which means more of the clothes we do get may not fit her well as her body is morphing from her former willowy shape to one with more curves. Still, I have to keep working on this task, because I am hoping to not have to mess with it much this weekend so I can spend time with my husband. He is feeling better and hopes to be coming home tomorrow evening. Now that I have written out my goals, perhaps I will be motivated to get it all done by tomorrow afternoon.